European ash (Fraxinus excelsior) is threatened by Hymenoscyphus pseudoalbidus, the agent of ash dieback disease. Beside ordinary ash dieback symptoms, collar rots have been reported on declining ashes as an additional problem of increasing severity. Since 2009, ash dieback has been surveyed annually in a provenance trial on four different sites in southwest Germany (Metzler et al. in Ger J For Res 183:168–180, 2012). The trial was established in 2005. Data of tree growth, ash dieback symptoms and collar rot prevalence were collected by surveying the trial in summer 2012 and compared with previously published data of the trial. Evaluations revealed a continuous and considerable increase in dieback severity since 2009. The results suggest that the infection process has not come to a standstill yet. Up to 2012, 6 % of the trees remained symptomless, whereas mortality added up to 9 %. There were significant differences in ash dieback severity between the investigated provenances. Collar rot prevalence ranged from 19 to 59 % between study sites. Moreover, high spatial dependency of collar rot prevalence could be detected within sites. Collar rots were more abundant on trees of severe ash dieback intensity, but could also be detected on 15 % of otherwise healthy trees. Mycelium from collar rots could be identified by means of RFLP analyses and sequencing of the ITS region as most likely belonging to Armillaria gallica. The possible roles of Armillaria spp. and H. pseudoalbidus in collar rot formation are discussed. Our special thanks go to Hermann Schott for his great commitment during the surveys every year. For supporting the surveys, we thank Katarina Töpfner, Daniel Zapf, Ricardo Rivero, Jürgen Wahl and Christa Wessel. Tangible support in laboratory work was provided by Gudrun Seiffert. 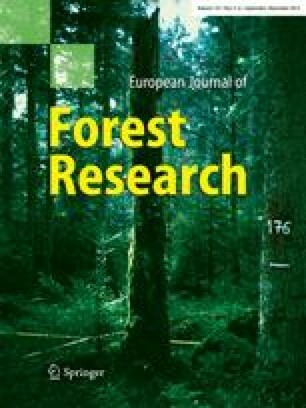 Furthermore, we thank the involved forestry officers of the forest departments Rastatt, Emmendingen and Ortenaukreis, and anonymous reviewers for valuable comments on the manuscript.